To track trends in Fremantle visitor numbers, the City of Fremantle and key stakeholders have created an index to monitor changes in visitor numbers over time. The index combines data from 12 different sources at key attractions in Fremantle. 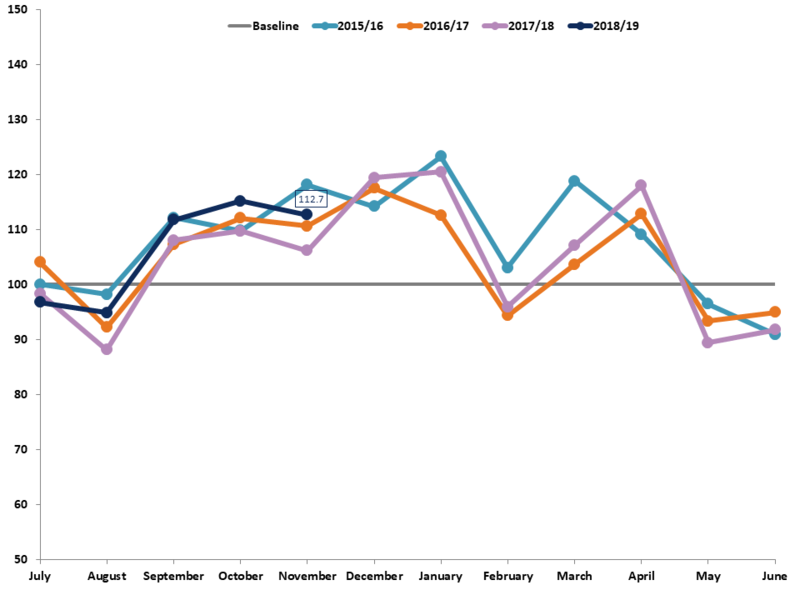 The operators of the attractions share their visitor data with the City each month, it is averaged and compared against the baseline index of ‘100’ in July 2015. Additional data sources can be added to the index as they become available. The graph above shows the visitor trend from July 2015, which is used as the benchmark month (i.e. 100). This means that a visitor score of 116.6 in November 2015 is a 16.6% increase in overall visitor numbers to Fremantle compared to the baseline month of July 2015. Conversely, a visitor score of 94.6 in August 2015 is a 5.4% drop compared to the baseline month of July 2015. The graph also shows the visitor numbers by month for different years. The 2015/16 financial year is shown in blue and the 2016/17 financial year is shown in orange. This allows comparison of the visitor numbers in the same month of different years. Using the month of October for example, visitor numbers were greater in 2016 (index score of 112.3) compared to 2015 (index score of 107.7). As time goes by, the graph will be updated to show figures for each future year. The Fremantle BID have decided not to renew a contract with a WiFi based pedestrian counting system, instead they will be expanding the network of an existing more reliable infra-red based pedestrian counting system. The data from the WiFi based system was used in this index from July 2016 until July 2017. Due to significant disruptions in the City of Fremantle's free WiFi service as a result of upgrades to Fishing Boat Harbour and the Kings Square project, the data from the WiFi network will not be used from July 2017 onwards until the network is restored to full capacity.